We have been so into learning about space lately. Yvann is really excited to understand how we go to space, how does the surface of the moon look, what happens to gravity? We are diving deep and iI will be sharing a lot over the coming weeks. For now, I am giving you a quick look at a craft we did – exploring the surface of the moon with textured paint! Psst! Be sure to scroll down to grab your own set of Moon cards! When it comes to crafts, I simply present the materials and demonstrate the technique. It is very much open-ended and up to my son to decide how he wants the craft to look. I was definitely planning on making some fluffy paint. I thought it would be so cool to show Y… and then we had no shaving cream in the house. So, I tried to find some other things we did have – flour and white paint. Yep! White paint and flour would have to do then! It did work to add a nice craterlike effect on the paper. I also presented a star-shaped hole punch, and yellow construction paper. Y got to make stars to place around the moon. The final result – all done by the kiddo! He put the stars on the moon hehe. Moon Activities - how do craters form? 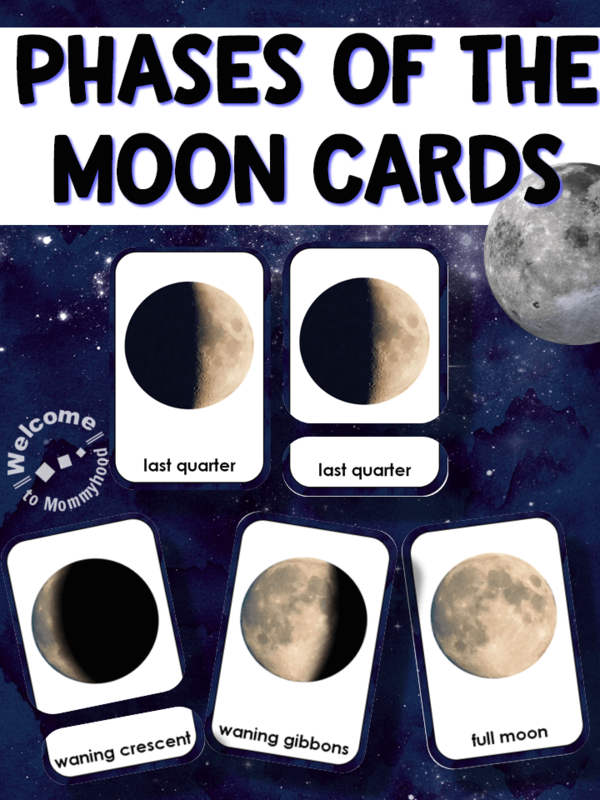 Get your own Phases of the Moon Cards for free!